Betsy Gay was born in Waterford, Connecticut. She started performing with her family at age 3. Her parents, Prof. Charles and Helen Gay had a music school and taught singing and gave lessons on piano, banjo, violin, steel guitar bass, accordion and guitar. Because of the family music school, Betsy and her sister and brother started doing shows at an early age and continued while they were growing up. The family moved around a bit in Betsy's early years. They lived in Pennsylvania, West Virginia and Youngstown, Ohio. In September of 1935, the family moved to southern California. Betsy indicated during our interview with her that it was to help her brother's asthma - the doctor recommended moving to Florida or California. The family moved to Hollywood when Betsy was six years old. Betsy got into movie making almost immediately. 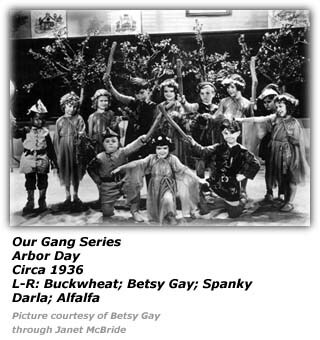 She was in the 'Our Gang Comedies' beginning with 'Arbor Day' in 1935. The 'Our Gang Comedies' later became known as the 'Little Rascals' when they started running on TV. When she started with the Our Gang Group she was one of 8 little girls and boys who sang and did a tap dance routine. 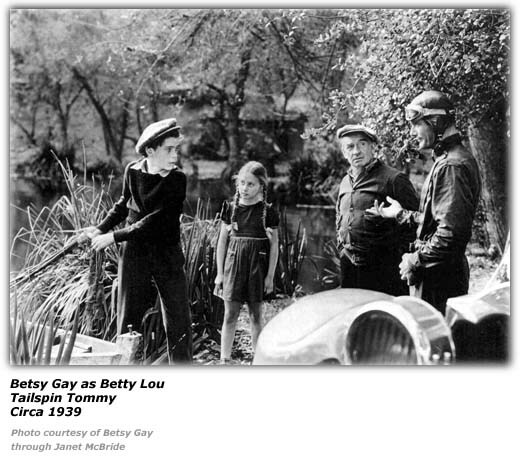 Betsy was in several episodes before becoming 'Effie' the girlfriend of Alfalfa. She was in many more episodes after she was given the part of Effie. She was with the studio and the Our Gang Group for over 4 years until sometime in 1938. During the same period and over the next several years Betsy appeared in over 40 feature movies until she was 13 years old. Betsy had some speaking parts and she also sang and yodeled in some of the movies. A note in Betsy's movie listing indicates that the list was due in large part to the records her mother kept through the years, though much of it is still safely stored away which Betsy hopes to get to in the future. 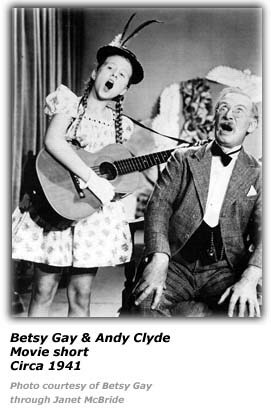 By age 12, (1941) Betsy was asked to sing in an Andy Clyde movie short for Columbia Pictures. They also wanted her to yodel in the movie. Betsy quickly learned to yodel by listening to Wesley Tuttle who at that time was on the Stuart Hamblen Radio Show. At that time Stuart Hamblen was on daily on KFWB in Los Angeles. This was the start of her career in Western music and yodeling. Betsy Gay remains good friends with Wesley and Marilyn Tuttle today. 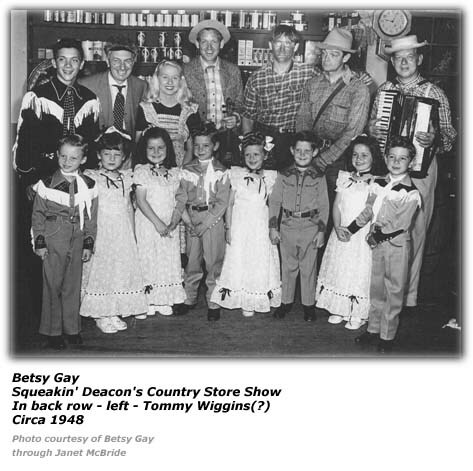 Betsy was a regular part of her parents family radio broadcast in 1943. They were known as the Gay Family. Though just in her early teens, Betsy handled the emcee chores of the show. They featured Western Music and by now Betsy was becoming an accomplished yodeler. Many of the songs Betsy and the family sang in those days were written by her mother. Her parents were accomplished musicians. Her mother played the piano and her dad played guitar, fiddle, steel and banjo. 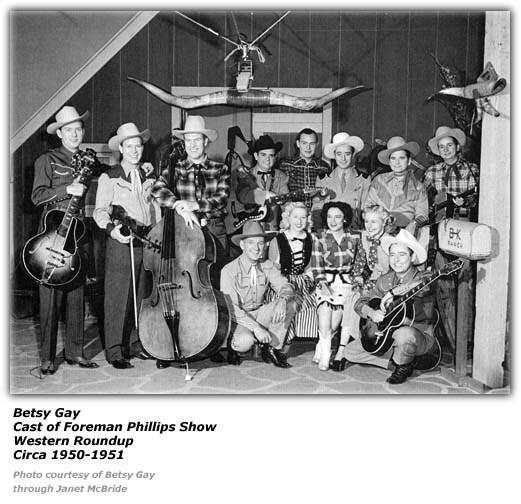 At the time the Gay Family was doing their show, Bob Wills was also doing a radio show on the same station. Betsy was asked by Bob to appear on his show. Betsy was about 14 years old. She remembers singing 'Red Wing' and 'Belle of the Old Barn Dance'. Betsy says that both songs had a yodel in them. Bob Wills was known for liking to have girl singers who also yodeled as guests on his bandstand. 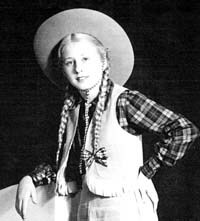 During the war years Betsy was the youngest entertainer to sing and yodel for the Hollywood Victory Committee Shows. (1943-44-45) Betsy said that she loved performing at these shows. An army driver would pick she and her mother up and along with 3 other entertainers would be driven to the base where the shows would be held. They would arrive at the base early and would always have a wonderful dinner, steak usually, before the show. Betsy said that meat was rationed then and no one could buy steak. Betsy said that even if it had been available, the family couldn't have afforded it. She was around 14 years old then. Some of the bases she appeared at were Camp Roberts, Camp Hayes, Fort MacArthur, Fort Ord, Camp Pendelton, The Army Base at Barstow, Camp Santa Anita, Terminal Island, Camp Cook, March Field, San Diego Naval Station, Sawtelle and The Hollywood Canteen. She said there were many more but she just can't remember the names of them all. Some of the actors and actresses she worked with on these shows were Garry Moore, Vivian Blaine, Louise Beavers, Edgar Kennedy, Richard Lane, The 1 Black Crows, Al Pierce, Harpo Marx, Connie Haines, Radio Rogues, Johnny Coy, Chill Wills, Chester Morris, George W. Jessel, Anne Jeffries, Sidney Miller, Arlene Harris, Marilyn Maxwell, Joe Conte, Al Jarvis, Dale Evans and Johnny Bond. She remembers Dale Evans talking to everyone about just being asked to be in her first 'Roy Rogers' movie. In 1945 Betsy won the California State Yodeling Championship at the Olympic Auditorium in Los Angeles, California. In 1946, she repeated the feat and won the title again, this time at the Redondo Beach Barn Dance where she was then appearing on a regular basis with the Texas Jim Lewis band. Other acts appearing at the Redondo Beach Barn Dance according to Sunny Ciesla were Coby Jones, Arizona Slim and the Georgia Crackers. She made guest appearances on all of the great shows of the day including the 97th St. Corral. Some of the radio shows she appeared on were 'The Jimmy Wakley Show', 'The Don Ameche Show' called 'Your Lucky Strike' where she sang 'Belle of the Old Barn Dance'. She appeared on the 'Hank Penny Show' and her songs always included Western, Country and Comedy. She would yodel on all of these shows. Although she never had a hit single with a 'yodeling song', on each show she would sing some of the most famous yodeling songs of all. They included songs like 'Texas Plains', 'Chime Bells', 'Cowboy's Sweetheart' and 'I Want to be a Cowboy's Dream Girl'. 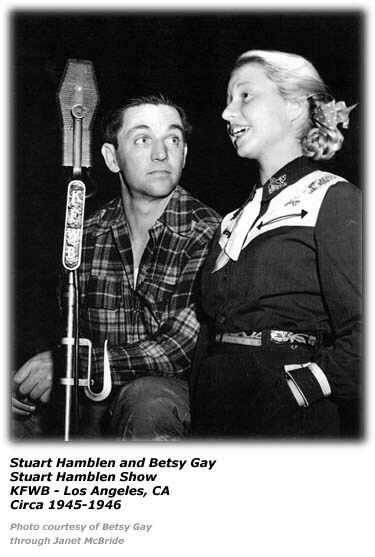 We find again Sunny Ciesla reporting in her "Round-up in Hollywood" column in 1948 that Betsy along with fellow yodeler and singer, Billy Lee. 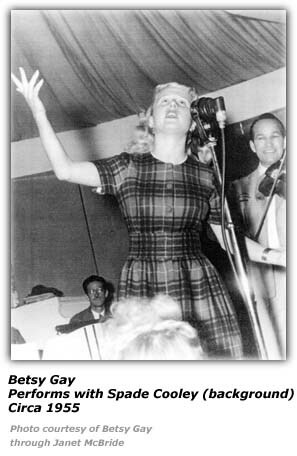 Betsy started her recording career in 1946. She made one record for the Superior Record Label. The tunes she recorded were 'Belle of the old Barn Dance' (written by her mother) which also included a yodel and 'Slam My Door When You Go Out' (also written by her mother). Sunny Ciesla wrote in a 1946 "Round-up In Hollywood" column about Betsy at the time. When she made the records for Superior, she was 16 years old. She noted, "...she has a clear voice and can really let loose on the yodels." Betsy, like many stars of that era, also had a fan club. The president of her fan club back then was Sally Garrett of Hollywood, California. Betsy told us that Sally was only about 14 years old at the time she started the fan club for her. Ms. Ciesla expressed her appreciation for being made an honorary member in the club as well as other fan clubs. Later in 1946, she had to leave the Los Angeles music scene for a tour on the east coast. Texas Jim Lewis ran a contest to find a female vocalist to replace her in his group. When we asked Betsy who actually did replace her, she wasn't quite sure, but she thought Becky Barfield did for a time. Later on, Sunny wrote that she had gotten a post card from Betsy letting her know the tour was going just fine. 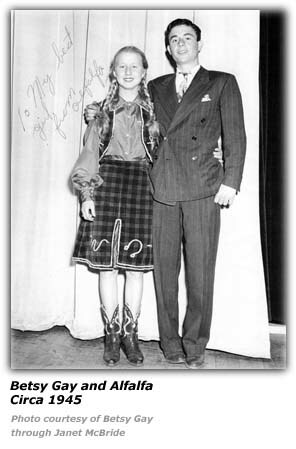 In spring of 1947, Sunny Ciesla told her readers that Betsy had returned from her tour back East and was working with Stuart Hamblen's Lucky Stars as well as The Western Caravan with Tex Williams. During that stint, she would team up with Smokey Rogers to do a bit of comedy and duets. Sunny again points out that it was Betsy's solo vocal efforts that resonated with her. Sunny noted that Betsy said that she just enjoyed "comic and jivin'" at that stage of her career. She recalled playing at the Palace Barn with Tex Williams and his Western Caravan. SHe said the barn was actually a converted bowling alley. Betsy was part of a group of performers that got together at the behest of T. Texas Tyler to put on a benefit show for the victims of the Texas City blast incident when the cargo of a ship caught fire and resulted in an explosion that could be felt or heard some twenty miles away according to some reports of the incident we have found. T. Texas Tyler persuaded artists such as Stuart and Susie Hamblen, Leon Rusk, Hank Penny, Al Dexter, Roy Rogers, Dale Evans, Sons of the Pioneers, Jimmy Wakely, Cliffie Stone, Carolina Cotton, Jimmy Widener, Deuce Spriggens, Tex Atchison, The Linvilles, Cowboy Jack Patton and a young artist T. Texas was helping out, a 16-year old blind singer by the name of Tommy Dickenson. Some folks such as Betsy made a dash from the dances they were appearing at to appear on the benefit show before heading back to their regular engagements. Ms. Ciesla points out that Hank Penny nearly stole the show with his witty ad-lib comments. She noted that it was also the first time she got to see Squeakin' Deacon Moore perform. In 1947,48 & 49, Betsy appeared regularly on Saturday Nights at the Riverside Rancho. Smokey Rogers and Tex Williams and his Band, The Western Caravan, had a radio show and dance there. Betsy also appeared through the 1950's with Tex Williams and his band. In 1949, Ms. Ciesla updates readers about a new Capitol Records release by Betsy, "I Didn't Know The Gun Was Loaded", with backup support provided by Andy Parker and the Plainsmen. In 1949 she appeared on Dude Martin's Western Music TV show on KLAC. 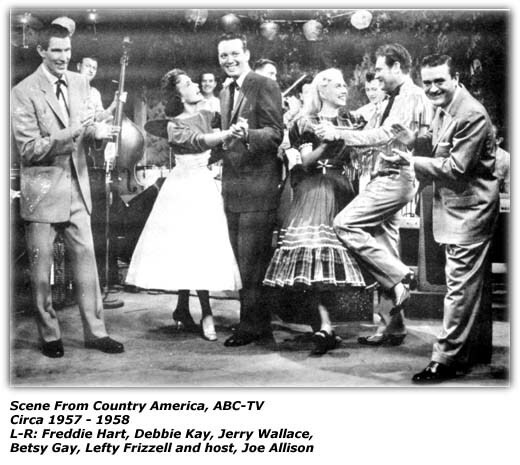 From 1948 through 1950 Betsy was a regular on Cliffie Stone's Hometown Jamboree TV Show and Dance at the El Monte Legion Stadium. In 1949 and 1950 she did a series radio transcriptions for the Armed Forces Radio Network. Redd Harper was the emcee of the shows. Along about 1950-51, Betsy recorded a hit record with Russ Morgan's band on Decca Records. The song was 'Mocking Bird Hill' with Mary Lou as the Gay Sisters. Betsy told us even though they weren't really sisters, this was an easy way to list them on the record. She recalled that she got $50 for her work on the record. Today, the artists would probably get a royalty payment for each record sold. But in this case, the Gay sisters only got the money for recording it. Again, in 1950-51 she recorded a song with Dinah Shore '10,000 Miles'. Betsy and Mary Lou yodeled again on this one and they were known as the "Gay Sisters". 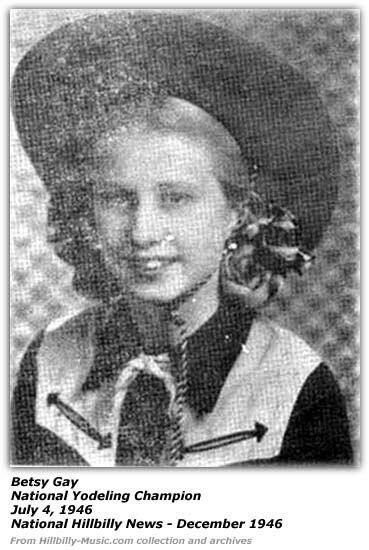 In 1950, she appeared at Ralph Hick's Barn Dance in Baldwin Park. In 1950 and 1951 she was a regular act on Forman Phillips 'County Barn Dance.' This show featured all of the regulars daily on ABC TV. Betsy always sang and yodeled and promoted her recordings. Some of the regulars on this show were Merle Travis, Johnny Bond, Wesley and Marilyn Tuttle, Rose and Joe Maphis, and Mary Lou. This show was the first show to be on daily TV for three hours, then have a dance on Saturday Night and then again on Sunday afternoon. The Sunday afternoon show was with a live audience. The cast of this show performed over 1,000 hours. During a three period of 1954 to 1956 Betsy was a regular on the Town Hall Party Television Show and Dance in Compton California. This show was on TV live every Saturday Night for three hours. The cast included Tex Ritter, Johnny Bond, Freddy Hart, Merle Travis, Wesley and Marilyn Tuttle, Joe and Rose Maphis, The Collins Kids, Les Anderson and special guests like Gene Autry and Ray Price. Betsy sang Country, Western and Comedy songs and added yodeling songs every week. From May of 1957 through 1959 she was a regular cast member of 'Country America' on KABC TV. The regular cast included Betsy, Lefty Frizzell, Johnny Cash, Faron Young, The Everly Brothers, Debbie Kay, Bobby Bruce, Freddy Hart a comedian named Candy Candido and others. Some of the songs Betsy sang on this show were 'Red Wing', 'Chime Bells', 'He Taught Me To Yodel', 'I Want To Be A Cowboy's Dream Girl', 'Yodel Lady', 'Roundup Time In Texas', 'Texas Plains' and 'Where's Your Horse'. Joe Allison was the master of ceremonies for the show. The show was directed by Don Whitman and was a produced by Nat Nigberg. We mentioned that Betsy's mother kept everything from her daughter's career. And Betsy kept it all. Betsy shared with us several copies of the scripts from the Country America show that was broadcast over the American Broadcasting Company network. While we're not ready to put their scripts up in their entirety, we can at least provide the "Television Production Notes" that were on the first page of each script. Stebbins and Cochran Supervisor: WIlliam A. Dyer, Jr. In 1961, Betsy was on the Mike Douglas Show 'International Party Time' which ran on TV for 13 weeks. On this show they would salute a different country every week. Betsy was featured on this show each episode and usually did a yodeling number on the show. In 1962, Betsy appeared as a regular performer on a Polka Show. The people that put together the show just asked her to do her trademark yodeling tunes. The show only ran for 13 weeks. We have no other details about this show such as who was the main star or host. 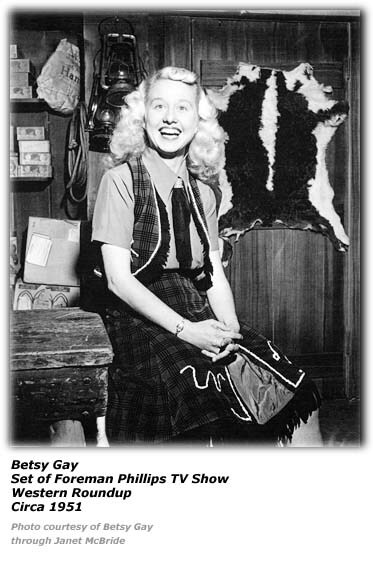 Betsy Gay made appearances on numerous television shows that were hosted by famous acts as Lawrence Welk, Doye O'dell, Spike Jones, Spade Cooley, Ina Ray Hutton with her all girl Band and the Dinah Shore Show. Starting in 1964 Betsy sang for four years with Benny Strong and his orchestra at Myron's Ballroom in Los Angeles. She did a variety of songs including old standards, novelty and yodeling songs. This show was on KFI Radio every Saturday Night. In the 1970'S Betsy sang only occasionally and took time off to raise her family. Betsy Gay sang at senior centers, retirement homes and convalescent homes until recently when her voice started giving her problems. She married Thomas Cashen May 29, 1954 and had 5 children. Betsy told us she met her future husband at a church club. The groups would get together and go to group outings such as bowling and ice skating. Twins Mimi and Gigi, Tommy, Suzy and Cathy. She focused on her children singing and performing. Her twins, as babies, appeared in the movie 'Giant' that starred Elizabeth Taylor and Rock Hudson. The twins also appeared on the Tennessee Ernie Ford TV Show and the Johnny Carson TV Show. The girls also made commercials. Her legacy carries on. Her children and grandchildren all play instruments and love music. She has sixteen grandchildren. Betsy now lives in Bakersfield, California. Her husband Thomas Cashen, who ran Cashen Jewelers in Los Angeles that was located on Olympic Boulevard. Tom was a watchmaker for over 50 years. He passed away in 2005. Hillbilly-Music.com wishes to thank Janet McBride for getting in touch with Betsy and helping us to document Betsy's career and discography as well as providing us with the electronic copies of various pictures from Betsy's career. Hillbilly-Music.com wishes to thank Betsy Gay herself for allowing us to interview her and obtain more of her recollections.